For those living in rural areas, with no access to the mains gas grid, LPG (Liquid Petroleum Gas) is an excellent heating solution, offering a close alternative to mains gas. LPG is a naturally occurring by-product of natural gas extraction (60%) and crude oil refining (40%) and if it’s not used as a fuel in its own right, the by-products would be disposed of. What’s its impact on the environment? 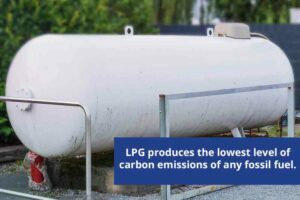 LPG produces the lowest level of carbon emissions of any fossil fuel. It generates on average 15% less CO2 than oil – per kilowatt-hour – and 50% less than coal. It poses no pollution risks to ground or water and produces no harmful or potentially dangerous waste. Very. It has a higher calorific value per unit than other commonly used fuel, so using LPG can help reduce energy bills. Can it be used anywhere? Yes, it’s a very flexible source of energy. Perfect for domestic heating and hot water as well as cooking, it’s also suitable for a variety of commercial applications – even in the most remote parts of the country. LPG can be stored in cylinders or in a bulk tank, which can be located underground or above ground. Many suppliers offer regular, automatic top-ups to ensure it won’t run out. What do I need to do to become an installer? Logic4training delivers a range of LPG courses, including the newly introduced LPG Vessels package; a two-day training and assessment programme for experienced LPG operatives requiring the skills and knowledge to carry out the installation and commissioning of bulk LPG storage vessels. The course also trains engineers on how to carry out electro-fusion jointing of PE pipework up to a maximum diameter of 63mm. Applicants must hold an LPG ACS qualification, CCLP1 or CONGLP1 before they apply. What does the LPG Vessels course cover? To help LPG installers and their communities take advantage of the benefits of LPG, Calor has set up a rural community fund, with money available for off-grid LPG projects, such as village halls and sporting venues; anything that will be advantageous to the wider community. A total fund of £50,000 is available across the UK, split out into 21 individual prize pots. Providing a perfect conversation starter for LPG installers wishing to engage with rural communities, Calor, along with National community action groups, Business in the Community and Rural England will judging applications. Applications can be made through the Calor website from 20th March until 1st May 2018 and LPG heating installers nationwide are encouraged to get on board!